Today on Robot Wars we saw the ending of the current series in what can only be described as pure carnage as robot after robot tore was torn apart. In the grand final we saw the previous heat winners Carbide, Aftershock, Eruption, Concussion, and Ironside 3 joined by wildcard Apollo (thankfully the godawful Cherub didn’t get chosen). Unfortunately for amateurs Concussion and last year’s winners Apollo both went out in the group stages, as the others ruthlessly ganged up on them as both were smashed repeatedly by spinners. Apollo in particular was hardly its former self, still bearing the damage from Carbide from the previous fights. In the head to heads the carnage began rather quickly once Carbide got the change to go toe to toe with the others and it quickly became obvious who was going to win easily. Battle after battle for Carbide saw basically reduce everyone else to trash, including the grand final. The worst of these was the fight with Aftershock which saw a side of the bot go straight through the first protective wall around the arena. Aftershock was reduced to being taped together for the next match. 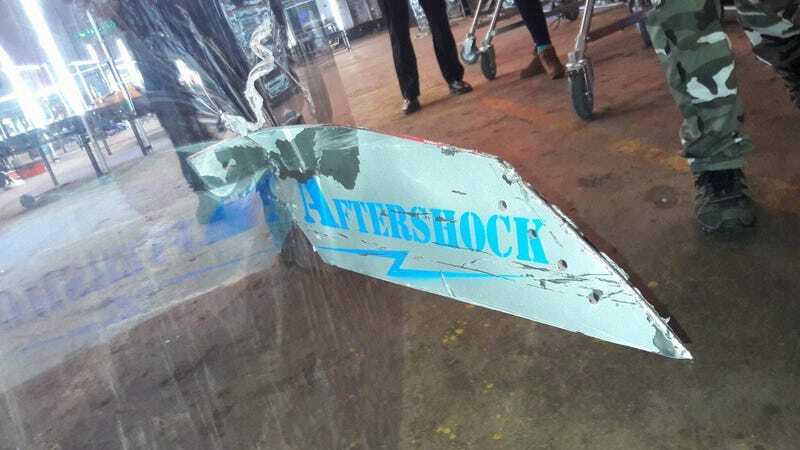 This issue of Aftershock going through the safety glass is the latest in a series of issues with the arena this season that have shown up the arena to be not fit for purpose. In this episode alone we had the safety glass pierced, the floor paneling coming off twice causing robots to get stuck, and blindspots in the control rooms while for the series as a whole they’ve also had the flipper falling apart, the pit cover pressure failing meaning it collapsed, and the slanted metal walls tearing off multiple times. Quite clearly the arena can’t handle the robots yet nothing appears to have been done to reinforce it between series. While the show was won by Carbide and it provided the grand spectacle many of the more interesting fights were between the other robots in the last four. It was quite exciting to watch these crippled messes of machines trying to put enough back together in the two hour repair window, which is too short in my opinion given the damage they can do, and still fight. This saw fights such as Ironside 3 vs Aftershock where each was trying to reduce the damage they suffered due to the threat of facing Carbide in the final and therefore being more careful with their moves. It was a glimmer of what the show can be as opposed to what it currently is. In the end while it was a spectacular episode in terms of destruction I can’t help but think the show’s current favourite PR show Carbide could be a double-edged sword. The level of entry is now ridiculously high, meaning some robots can’t even get into the competition that used to be common, and can turn people away as why spend several hundred pounds only to be turned into scrap after 30 seconds by a professionally made death machine?